It's the poshest spice of all, often worth its weight in gold. But saffron also has a hidden history as a dye, a luxury self-tanner, and even a serotonin stimulant. That's right, this episode we're all about those fragile red threads plucked from the center of a purple crocus flower. Listen in as we visit a secret saffron field to discover why it's so expensive, talk to a clinical psychologist to explore the science behind saffron's reputation as the medieval Prozac, and explore the spice's off-menu role as an all-purpose beautifier for elites from Alexander the Great to Henry VIII. Saffron's origins are a mystery, with competing claims placing the wild plant's origins in regions along a wide, semi-arid swath from Greece, in the eastern Mediterranean, to Central Asia. Today, the vast majority is still grown in that belt, with Iran leading the world's production. But in the 1500s and 1600s, the center of the saffron universe briefly shifted from the sun-baked Mediterranean to rainy England. One particular region of England became so internationally famous for its saffron—in fact, each autumn, the entire area was carpeted in purple petals—that the local market town of Chepying Walden changed its name to Saffron Walden. But by the 1800s, England's saffron fields had vanished entirely. Two hundred years later, a restless geophysicist named David Smale decided to try cultivating English saffron again. This episode, we visit his field at a secret location in Essex to learn how saffron is grown, hand-harvested, and dried—and Smale's uphill battle to uncover the lost art of successfully coaxing saffron from England's soggy soils. Cynthia taping David Smale in his saffron field in June (photo by Nicola Twilley); the first saffron flowers of the year in the same field in late September (photo courtesy English Saffron). Smale also told us that "crokers," as people who harvest saffron are called, have to take a break during packing to avoid getting the giggles. "It's got a distinctive smell," said Smale. "It's beautiful and it's quite heady—you have to get fresh air every so often because it is a narcotic in big quantities." It turns out saffron's mood-altering reputation has some serious science—and some surprising history—behind it. To learn more, we talk with clinical psychologist Adrian Lopresti, who's studying saffron's efficacy as an anti-depressant. We also speak with musicologist Volker Schier about the cache of letters he discovered, which reveal that medieval nuns were hooked on the stuff. "I call it singing under the influence," Schier told us. The nuns each had their own stash, he said, which they'd take "if they needed it—as a stimulant." Join us this episode for all this, plus the recipe for a golden swan, as we explore the secrets of saffron. 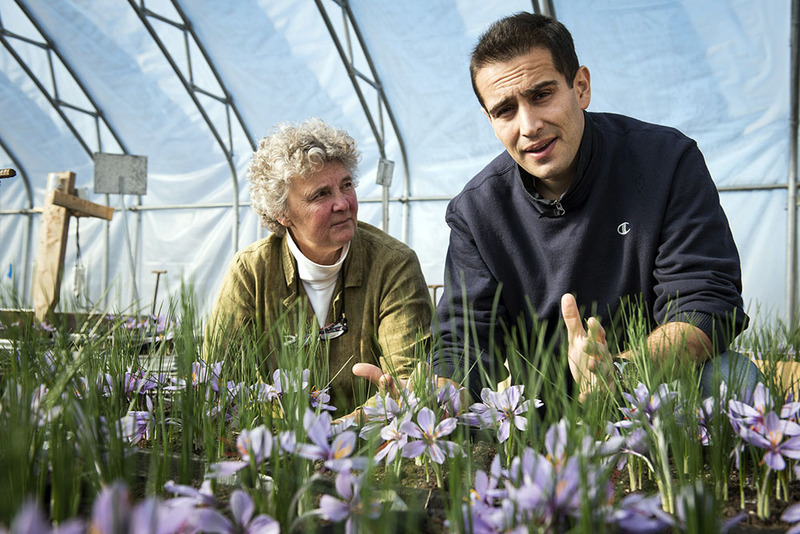 Margaret Skinner and Arash Ghalehgolabbehbahani in the high tunnel in which they successfully cultivate saffron in Vermont. Photo by Ian Thomas Jansen-Lonnquist for UVM. 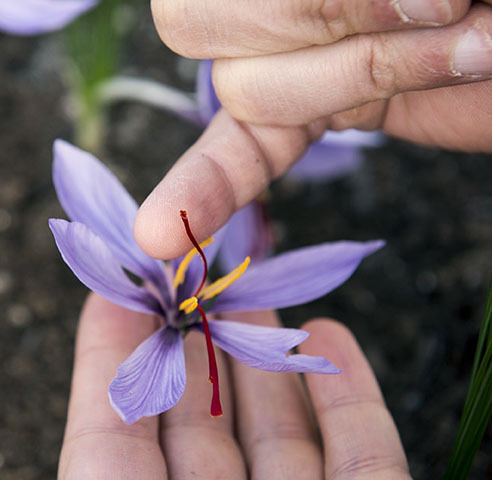 David Smale started growing saffron in 2004—the first time the spice had been grown in England for two hundred years. Together with his wife, Penny, he now sells his gorgeous, honey-scented saffron to chefs and also from his own online shop, where you can purchase his unique saffron gin as well. You can also see his saffron growing in a small plot at Bridge End Garden in Saffron Walden, and taste it in truffle form at the Hill St. chocolate shop, nearby. 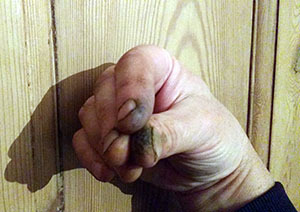 David Smale unwraps his saffron stash (L) and shows us its efficacy as a self-tanner (R). Photos by Nicola Twilley. Saffron flower showing the purple petals, red stigma, and yellow style. Photo by Ian Thomas Jansen-Lonnquist for UVM. Margaret Skinner is an entomologist who specializes in integrated pest management. Arash Ghalehgolabbehbahani is an Iranian with a Ph.D. in agro-ecology whose wife was studying in Skinner's lab. Over lunch one day, Ghalehgolabbehbahani was chatting with Skinner and suggested that saffron might grow in Vermont. Together, over the past three years, they've worked out how Vermont farmers might successfully cultivate saffron in high tunnels, in order to serve as a cash crop that blooms during the slow season. Adrian Lopresti is a clinical psychologist and researcher at Murdoch University in Perth, Australia. In 2014, he co-authored a review paper in the journal Human Psychopharmacology, titled "Saffron (Crocus sativus) for depression: a systematic review of clinical studies and examination of underlying antidepressant mechanisms of action." In 1998, Volker Schier, a musicologist at Arizona State University, and his colleague, art historian Corine Schleif, discovered a cache of 62 letters written by a medieval nun, Katerina Lemmel. Lemmel was a member of a wealthy family of spice traders in Nuremberg, in modern-day Germany, who entered the abbey of Maria Mai in 1516. Her letters contain a wealth of detail about everyday life as a medieval nun, but also include her spice orders for the abbey. Schier and Schleif have collected the letters and their analyses in a book, Katerina's Windows: Donation and Devotion, Art and Music, as Heard and Seen in the Writings of a Birgittine Nun, as well as several papers, including this one on the nuns' use of saffron. David Smale demonstrates "croker fingers," stained purple by the crocus petals. Photo courtesy English Saffron. Author Pat Willard's Secrets of Saffron: The Vagabond Life of the World's Most Seductive Spice was published in 2002.